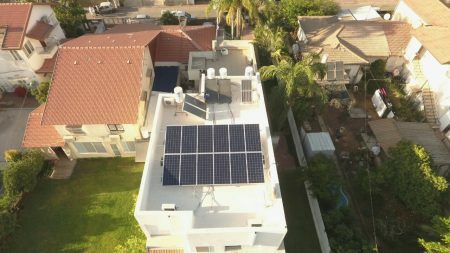 The solar energy system in Kibbutz Revivim was installed on top of the cowshed’s and plant’s roofs, totaling over 30,000 square-meters of roof space with an installed capacity of 2.5 megawatts. This is one of the largest systems built in Israel on rooftops for the production of green solar electricity. 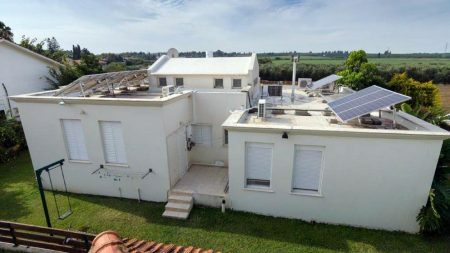 The main engineering challenges were dealing with a large number of roofs, and different slopes, geographic distribution of the system over a very large area and the transmission of high voltage electricity on the kibbutz’s premises. Approximately 10,000 panels made by Yingli were installed and 73 Kaco inverters. The system is in its final installation stages before its connection to the power grid.